Suppose you are managing 20 projects at a time, will it be possible to monitor every stage of all the projects simultaneously? Your answer would be a no because no matter how hard you try, you would certainly miss some of the important modules. Isn't it? Managing projects manually is just not possible in this ever-growing tech-world. Especially during the busy seasons, it becomes difficult to cope up with multiple projects at a time. At this point, it becomes necessary to come up with a solution to manage multiple projects effectively. It is quite important to know about how we can manage multiple projects in order to maintain accuracy and quality across all the projects. Remember, missing one single module while managing projects can let you face major losses and fall downs. So, it's time to know the top tips to manage multiple projects and stay on the safer side. Here is a list of tips which can assist you to manage multiple projects at a time. Don’t Multi-Task: As the project managers are asked to switch projects every now and then, this directly results in falling efficiency and chances of errors too. And as their concentration and focus splits, they are probably not able to work upon it effectively. So, it's better to focus on one task at a time and not switch tasks in between. Plan Ahead: What you can do is to plan your weekly task in advance, like you can plan on every Monday that which all tasks you need to carry out this week. This will assist you to prioritize your tasks properly as per their deadlines. Evaluating the current status, the left tasks, and other relevant things become easy for you. Proper Organization: If you are planning your daily or weekly tasks over a calendar which is not updated regularly, then you are on the wrong path. You must look up for a project management software which can automatically manage and record your tasks on a regular basis and makes automatic updates. Clear Communication: It is very important to know what other co-workers feel, think, and require. Moreover, regularly interacting with the team will assist you to keep a track of the team and know which project has reached which stage and needs to be focused more. Know How to Prioritize: It might be possible that you are working on a project which is not on a high priority. So, it becomes necessary that you prioritize tasks in advance so that you can put more focus on the projects which have a higher priority and are about to meet their deadlines. Avoid Distractions: Once you know that you are working on a project which is to be delivered soon and needs more efforts, put your complete focus over it and stay away from distractions. Whether it is another co-worker who's gossiping besides you, slack messages, calls hitting your phone, or any other distraction. Simply stay away and concentrate on your work. How jiPanel can assist you! Apart from these tips, if you have a huge workforce and are struggling with multiple projects, then it's time to switch to implement a project management system. 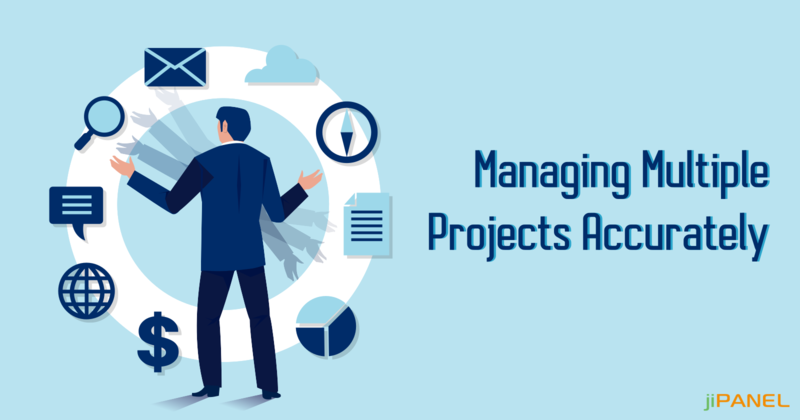 jiPanel is one such ideal project management software which lets you manage your projects and team with full accuracy and assists you in delivering project before hitting the deadlines. For more details and queries, get in touch with us!